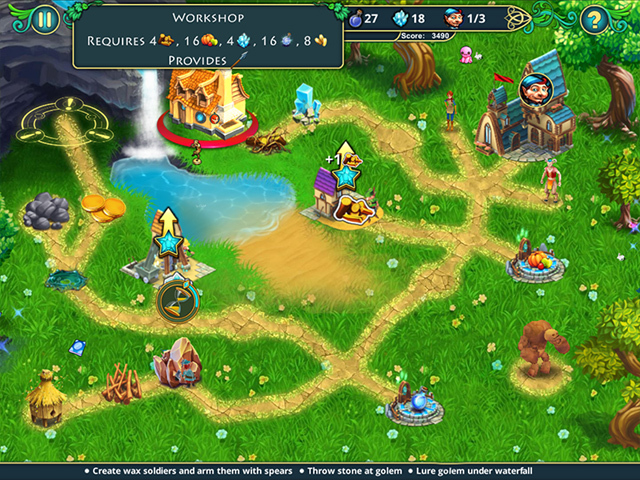 If you haven’t figured this out yet, I’m kind of addicted to resource management / time management games, so when a new one comes out, I’m all over it. 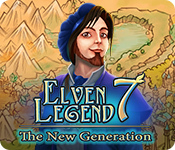 Elven Legend 7 The New Generation is the latest game that’s snagged my attention. It’s a fantasy story about a young, naive elf princess who is duped into creating golems with her magic to fight a war against her parents. After you watch the initial story play out where she foolishly believes a sinister looking fellow with red eyes, it’s up to you to help her right her wrongs and save the kingdom from her own disastrous behaviour. I mean come on… she just mindlessly believes some stranger and creates these giant war machines for him without ever second guessing him? Haven’t her parents ever taught her about stranger danger? I admit, it was hard to overcome the... well… idiotic behavior of the princess to enjoy the story. Maybe if it was just a little less obvious that she was being a dumbass, it would have gone over better. But for the most part, I just wanted to smack some sense into her instead of helping her through the initial levels. The graphics of Elven Legend 7 are pretty average. Definitely not up to par to some of the time management games I’ve been playing lately. There’s no much attention to detail on any of the boards and this sometimes hurt my gameplay because the buildings tended to look a lot alike and the characters blended into the background making it hard to spot what I was supposed to do next. The music wasn’t overly intrusive so I actually let it play instead of silencing it as I’ve been known to do for a few games. It had a lilting, rolling quality that seemed appropriate to the fantasy theme. The sounds were okay… although I could have done without the princesses voice at times. I do think it again is mostly due to the fact that I kind of hated her. 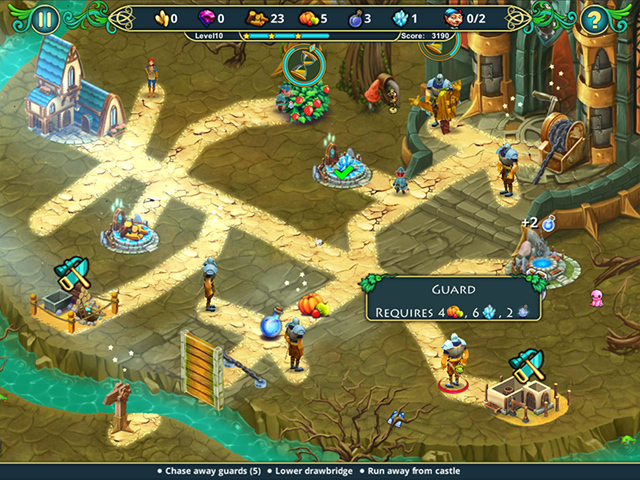 The overall game mechanics for Elven Legend 7 were well done. 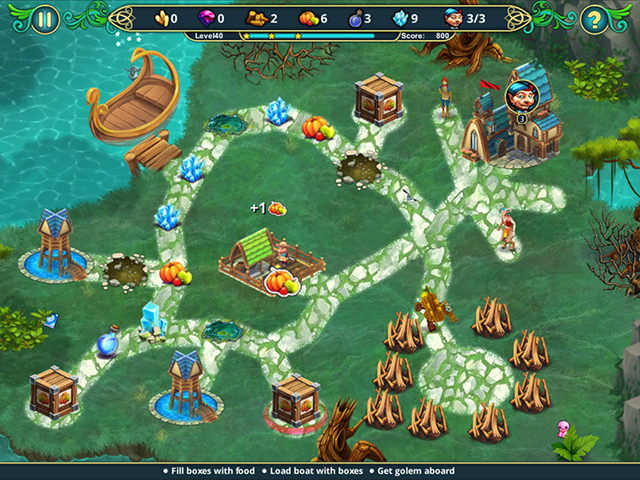 The game offered 3 different styles of play that included a relaxed mode, normal mode, and a professional mode. The collector’s edition offered several different types of items to search for on each level including golems, fauns, and books. I felt this was a bit of a stretch since they seemed to just be placed haphazardly on the boards. They didn’t really fit well and it was kind of weird to incorporate a hidden object aspect to a resource management game. So the big question is did I want to keep playing Elven Legend 7: The New Generation when my trial period was up? Sadly… the answer is no. I couldn’t get past the fact that I didn’t care for the main character I was supposed to be helping. She was really annoying. I also had a hard time with the writing in the game and I think this was due to a poor translation job. The text sometimes had poor word choices or didn’t make sense at all in some cases and it drove me a little batty that I had to stop and figure out what the copy was trying to telly me. Honestly, if you like resource management games, and you’re a fan of Elven Legend, you just might want to wait for the standard edition to come out and skip the Collector’s Edition. Of course, you’ll never know if Elven Legend 7: The New Generation is your type of game or not until you try it yourself. Play up to 60 minutes of Elven Legend 7 for free by clicking the download button above!